On the Precor EFX 546HRC version 3 you have all the trendsetting features of the original 546, but also the ability to monitor your heart rate closely, so you stay in your desired training zone and reap the rewards of improved Cardiovascular training, and measurable weight loss results. The touch-sensitive grips are comfortably located on the handles, and your HR number appears prominently on the electronic display in front of you. In fact, the 546HRC works with just the graze of a finger instead of a push-button, hence the name, Soft Touch Display. 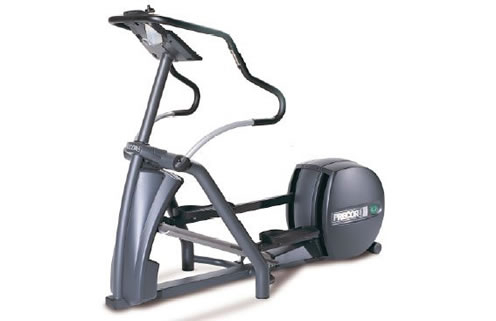 Like on the original 546, you will move smoothly in a natural arc on the Precor EFX 546 HRC, and you will still take advantage of forward and backward movement, and multiple CrossRamp® incline settings, for excellent crosstraining results. The EFX546HRC also has a double step-up flywheel, and Eddy current electro-magnetic braking system, for even more efficient and reliable performance. The frame has been re-designed and improved from the 546, providing an even sturdier base, and the cordless, self-powered 546HRC version 3 can be placed anywhere in your home or facility. With access to 20 different resistance levels and 8 pre-programmed workouts, plus a Quick Start option, the workout possibilities are endless on the Precor EFX 546HRC.